Autism Action Partnership: $3,000 to fund the Circle of Friends program in 10 schools. Arthritis Foundation Nebraska: $2,000 to send two kids to JA summer camp and a $500 sponsorship for JA Family Day. Brain Injury Alliance of Nebraska: $1,500 to fund outreach to one organization to train employees to screen, identify and manage brain injury. Crohn’s and Colitis Foundation, Nebraska/Iowa Chapter: $2,500 to fund two scholarships for Camp Oasis. JDRF International – Heartland Chapter, Lincoln and Greater Nebraska: $3,250 to fund two family movie days in greater Nebraska. Kidney: $3,850 to provide approximately 230 detection screenings in conjunction with CHAD workplace giving campaigns in 2019. UCP: $5,500 to fully fund the expansion of the Go Baby Go program to greater Nebraska. Additionally, Cystic Fibrosis Foundation - Nebraska Chapter received the first-ever #CommunityChoiceGrant. This $1,000 grant was awarded based on community vote. The purpose of the Foundation is to provide direct support for health programs whose impact would be vital to individuals and the community. These initiatives would not otherwise be possible through annual workplace giving campaigns or through current charity resources. 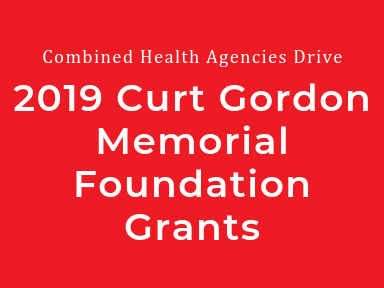 The Curt Gordon Memorial Foundation was established in 1997 as a response to the ever-increasing needs for services from CHAD’s member health charities. In July 2007, following the death of retired longtime President Curt Gordon, the Foundation was renamed in his honor. Funds must be used to expand existing programs or for new initiatives where the member charities’ current resources are not sufficient to meet the needs. All monies distributed through the Foundation must be used for funding very specific charity programs and may not be used for annual operating costs. Older PostOur 2019 Winner is . . .